A few weeks ago I was just minding my own business when the alert on my phone went off, politely informing me I had a new email. I expected it to be a spam comment notification from the blog, but soon realized it was a message from one of my absolute favorite companies – CB2. They wanted to work together on a little styling project. Oh snap! Talk about a major freak out. After collecting myself, I quickly responded, “Absolutely!” and the rest is history! The plan was very simple. 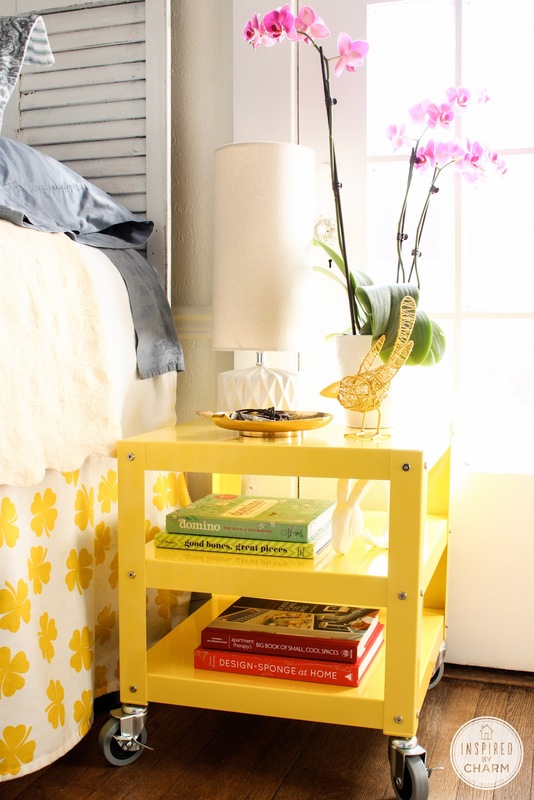 They would send me their colorful Go-cart Yellow Rolling Table, and I would style it in three ways. Pretty cool, right? Well, the day is finally here, and CB2 has shared my styling with the world – so I thought I would do the same here on IBC. I basically used what I had in my house to style the piece in various ways. For all three examples, I considered style and functionality. Let’s take a look. Style: This display is all about color. Some of my favorite design books in a rainbow palette gives an eclectic feel. The orchid adds drama and movement. Function: An antique brass ashtray acts as a collect-all for jewelry. A unique lamp provides much needed lighting for late night reading. Style: Clearly, I’m into gold these day. 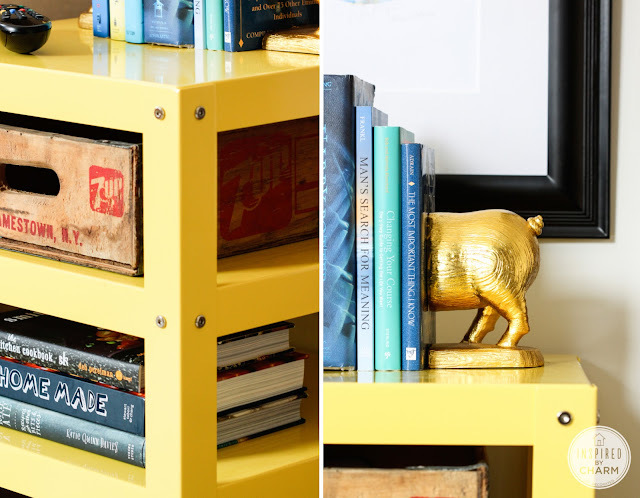 This pig bookend (also from CB2) has both style and whimsy! More books create a cooler color story and help to tie in the other accessories in the room. Function: I kept the top fairly clutter free to allow for remote controls, snacks, and beverages. 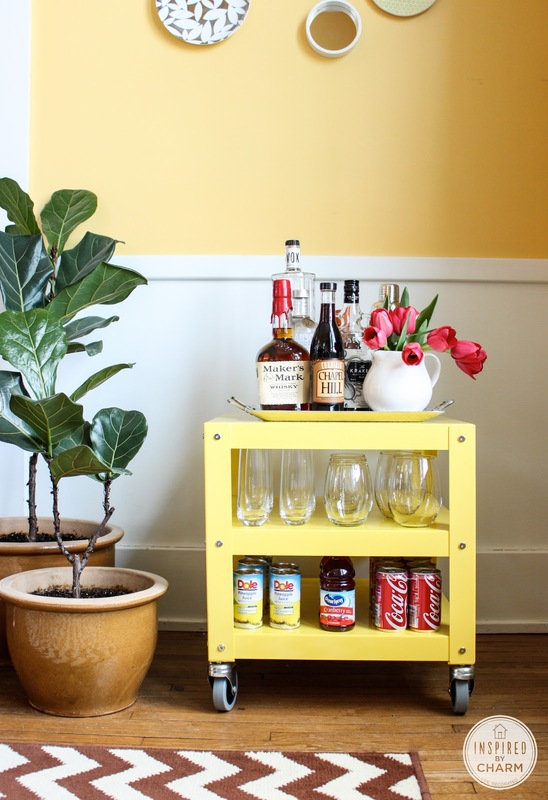 A vintage soda crate acts almost like a drawer for keeping things contained. Style: An inexpensive bouquet of tulips brings life and color. Keeping similar items on their own shelves means organized interest. 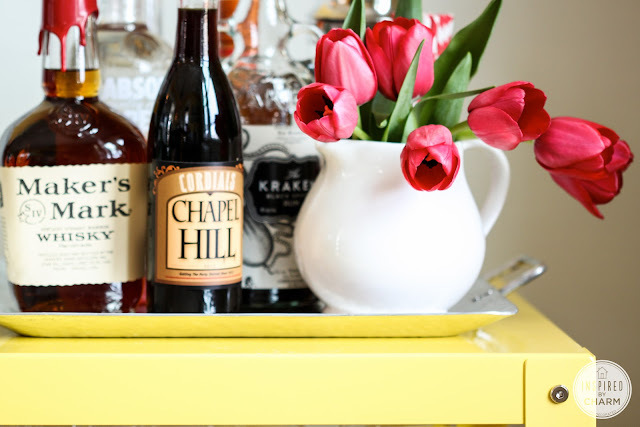 Function: A simple tray on top keeps the liquor bottles looking neat, tidy, and purposeful. Perfectly sized-shelves are ideal for storing glasses and mixers. I would say I successfully completed the challenge. I’m not exactly sure how I’m going to end up using the piece in my house. Right now it’s acting as a makeshift coffee table in my living room. But, I’d love to know – which look did you like best? A big thanks to the awesome folks at CB2 for the free cart in exchange for my styling expertise. I was not compensated or required to write this post, I was just over-the-moon excited to share this with all of you. Please note that the opinions, thoughts, and ideas listed above are my own. Love them all, but the end table is my favorite. CB2 is a great company, congrats on being chosen to style with them! Thank you so much! Yes – HUGE CB2 fan here! 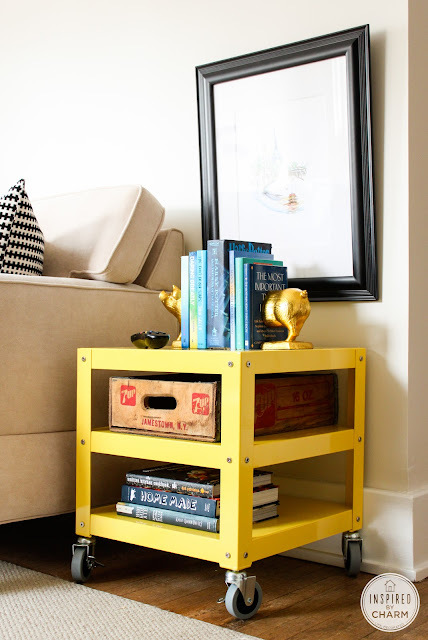 I really like it as a side table in your living room! It looks fantastic! 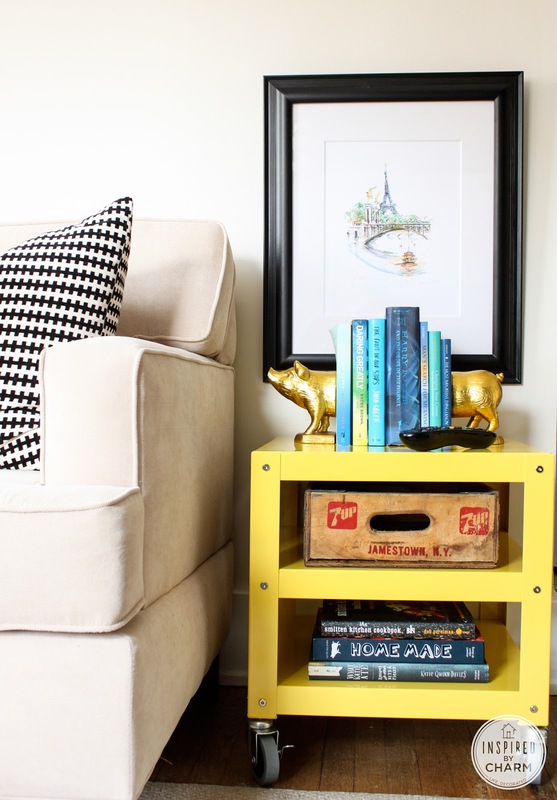 Especially with those gold pig bookends! You could buy another one and put them side by side as a coffee table. Would look great! Great job! Michael!! I love that little cart so much. I have a cart full of stuff over at CB2 that I need to hit buy on. I should totally add the cart. That yellow is such a fun color! I like your style Michael! Versatile, creative and fun. Thanks for the great ideas. May I ask where you purchased the bedside lamp? Of course! I actually got it at HomeGoods about a year ago. So unfortunately it may be tough to find at this point. I found you via CB2’s tweet and was thrilled to find a fellow MALE home blogger!! Your photos and styling are gorgeous. Love what you did with the cart! I really like it as an end table but that is probably because I am on the hunt for some unique end tables! The soda crate is a fantastic idea as a drawer because sometimes you need a place to “hide” things! First of all, Michael, I am loving every single way that you used that cart. Secondly, I MUST know where in the world you got that 7-Up Jamestown, KY crate. And if you’re willing to part with it!! You see, that’s where my mom’s family is from. And I lived there for 3-1/2 years when I was a teenager. It’s a small town in southern KY, so imagine my shock when I just saw this. All three were terrific, but the bedside table is AWESOME! Such a great job styling, you are my Nate Berkus!! I would have looked at that cart and thought, “Eh. Too industrial,” and passed it by. But with your stylings it looks so cute! I love the bar cart idea because with the casters you could easily wheel it around to wherever the party is going on, and the tulips just bring it to life. Great ideas! I know. I was thinking the same thing, but it totally works, right? Thanks for the kind compliment! All three looks are seriously brilliant. You are so talented and inspiring! Loved this post, congrats on hooking up with such a great company! My favorite is the bedside table…I like the openness…otherwise you stuff and lose track of what’s in there ( or maybe that’s just me!) Love your site! Love all three styles, but I would use it in the living room. That was my favorite. Thanks for introducing me to this company. Going to check it out tonite. So cute!! I want that cart! Would be fabulous on a front porch with some lemonade on it. I really like the end table idea, Michael and think that it would be a great bedside table in a small bedroom. I’ve been on a kick of spring cleaning lately and something with wheels that I could easily move? It rates high in my book. I have to tell you that I just sat and gaped at your new blog header. I’d been grooving on the embroidered pillow (from Target?) 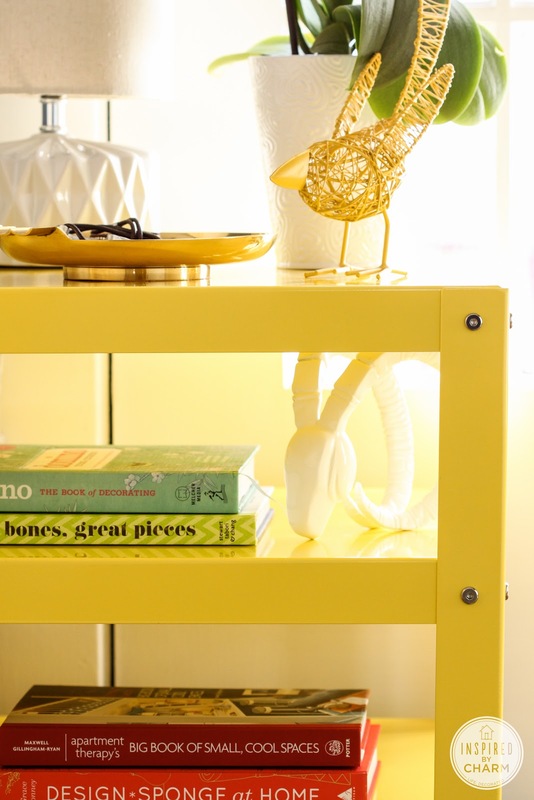 but that piggy bookend just has me heading over to CB2 right now. I love the tulips in the white pot, and I love this table. I wish I could get it, but I live in Australia. Will definitely be keeping my eye out for something similar, because this is genius! great styling! I love all the looks – best part is you’ve really shown how versatile and fun this piece is. 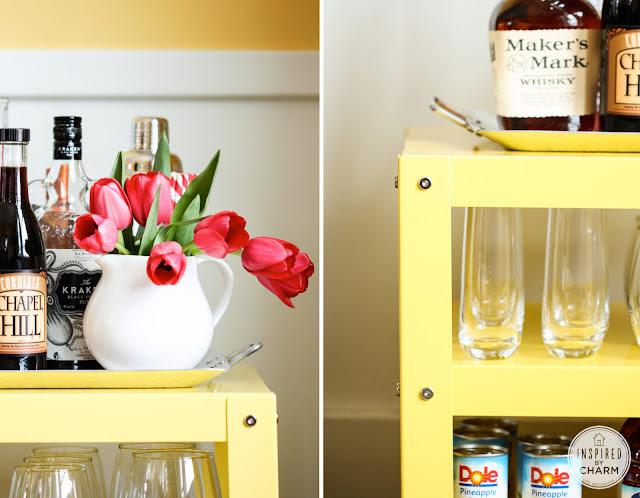 I think it would also work fabulous as a serving cart on the back patio for summer time entertaining! I love the cocktail cart- reminds me of Mad Men! 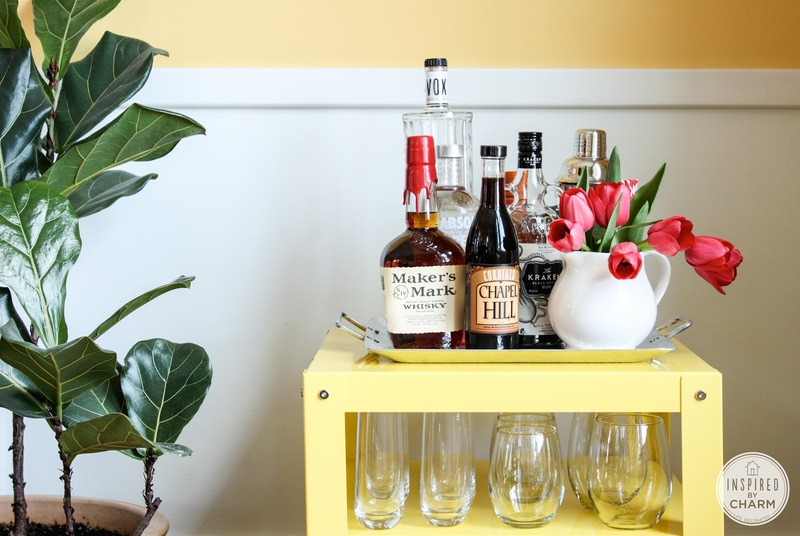 I think I love the end table the most, but the bar cart is pretty awesome. I’ve been looking for an old vintage one on Ebay but they all are so much! I love that you’ve used that, so it has the modern look but is so functional. You’ve inspired me to look at different options. Thanks! Love what you have done with the table! So happy I found your blog – visiting from Better Homes and Gardens and now your newest follower! LOVE this! I MUST go get one of those carts ASAP! Can’t believe they are so reasonably priced. Bedside Table is my favorite. How can you not be happy in that room? I fell in love with your style on Pinterest. Keep up the great work! Great Job! everyone tells a story….love the brown and white chevron rug…where can I find it? Hi Michael, I am new to your blog, so am late in responding, but I like the end table the best. 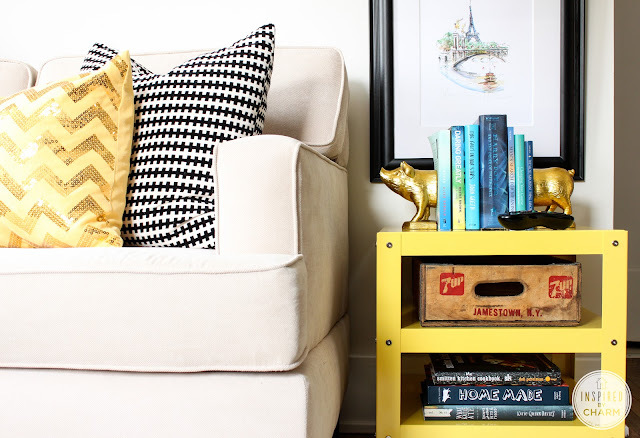 The scale is perfect with the couch, and a pop of color is great in every room. I do have a question…where did you get that adorable bird in the night stand photos? I am. IN. LOVE! With that little bird! I’m enjoying getting to know your blog, and I really like your sense of design. I wouldn’t put a label on it either, except “FUN”!